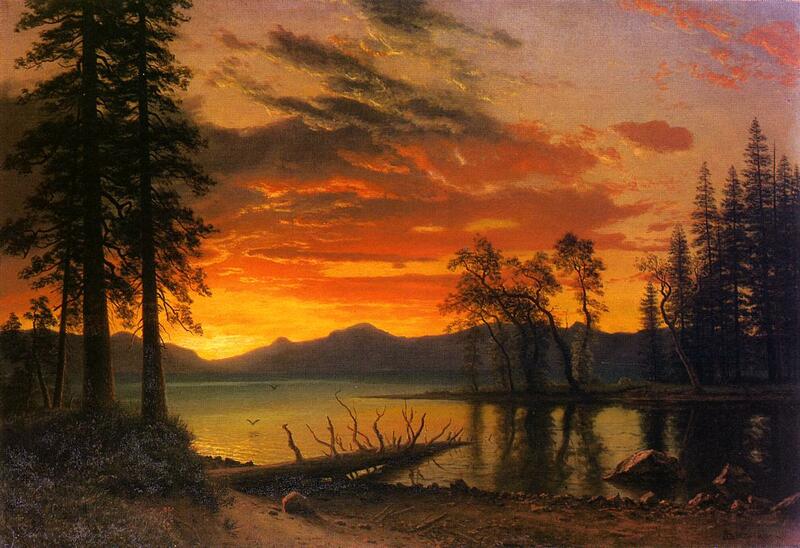 The Hudson River School was America's first true artistic fraternity. 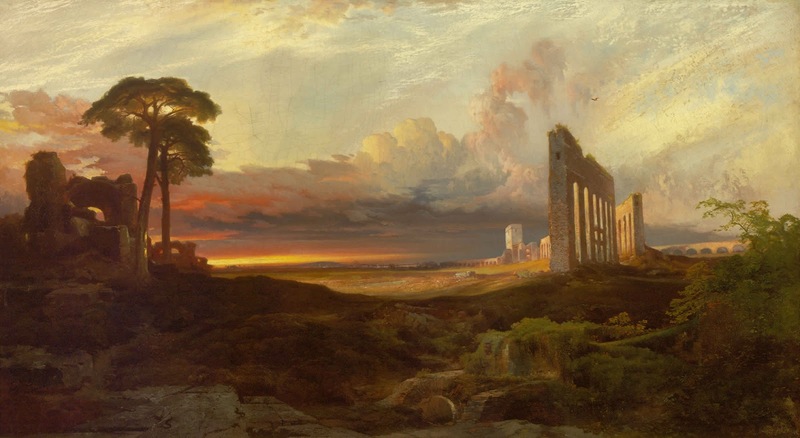 Its name was coined to identify a group of New York City-based landscape painters that emerged about 1850 under the influence of the English émigré Thomas Cole (1801-1848) and flourished until about the time of the Centennial. 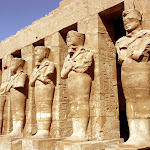 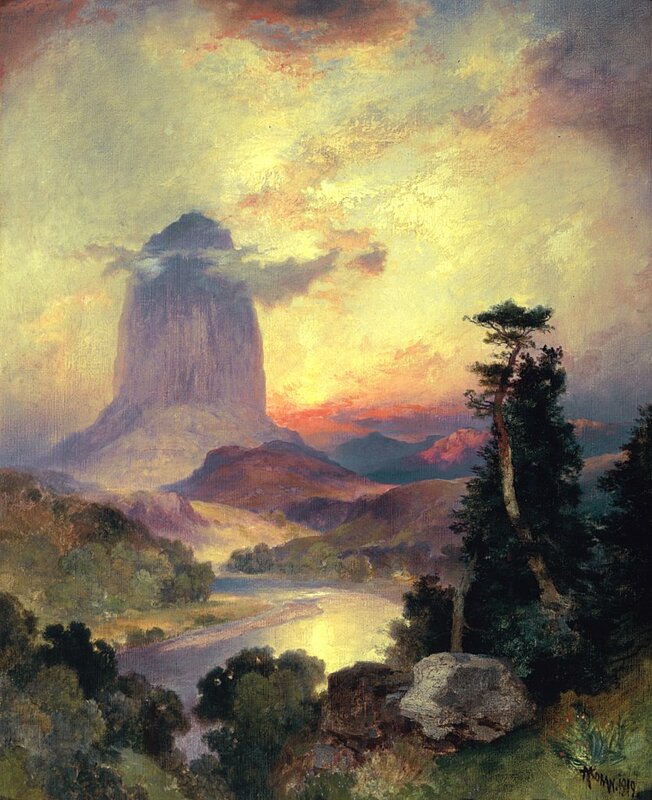 Because of the inspiration exerted by his work, Cole is usually regarded as the "father" or "founder" of the school, though he himself played no special organizational or fostering role except that he was the teacher of Frederic Edwin Church (1826-1900). 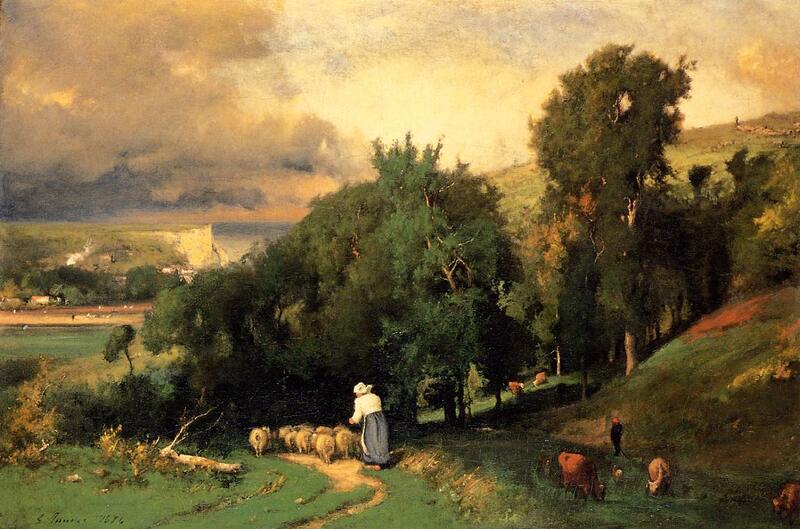 Along with Albert Bierstadt (1830-1902), Church was the most successful painter of the school until its decline. 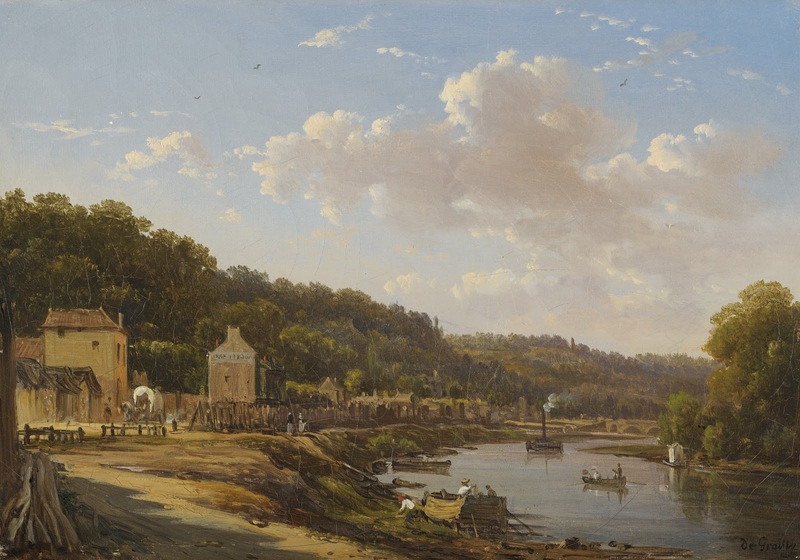 After Cole's death in 1848, his older contemporary Asher B. Durand (1796-1886) became the acknowledged leader of the New York landscape painters; in 1845, he rose to the presidency of the National Academy of Design, the reigning art institution of the period, and, in 1855-56, published a series of "Letters on Landscape Painting" which codified the standard of idealized naturalism that marked the school's production. 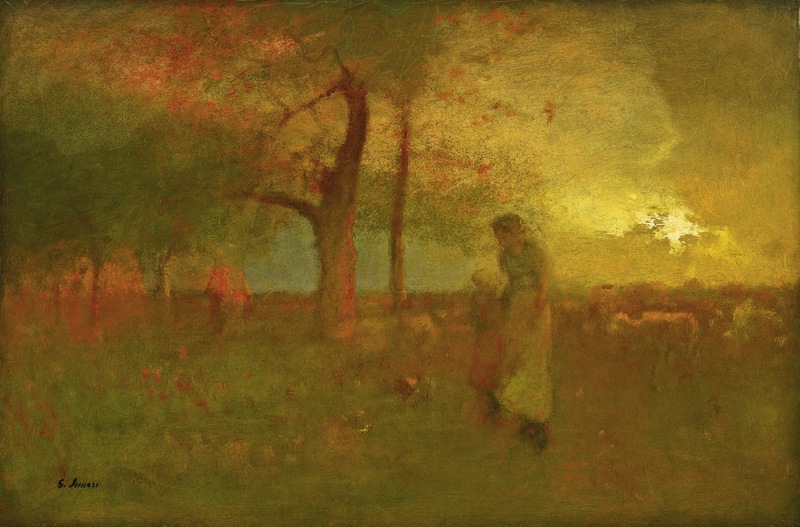 The New York landscape painters were not only stylistically but socially coherent. 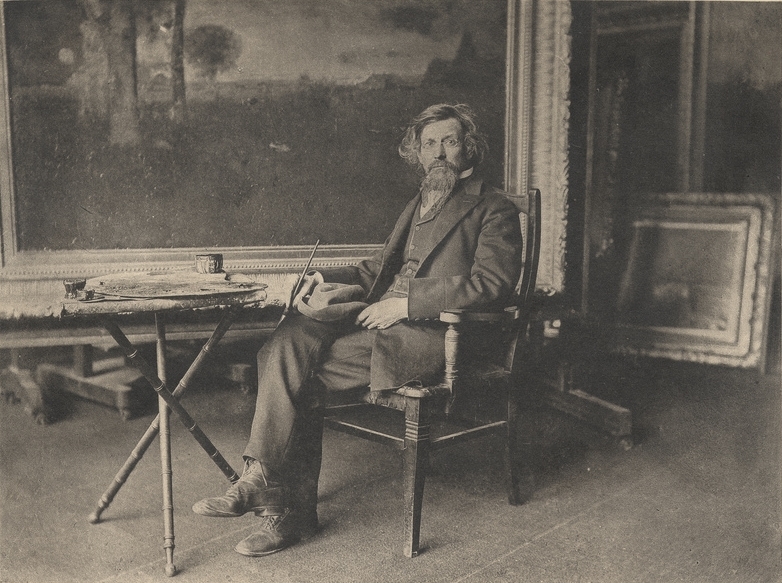 Most belonged to the National Academy, were members of the same clubs, especially the Century, and, by 1858, many of them even worked at the same address, the Studio Building on West Tenth Street, the first purpose-built artist workspace in the city. 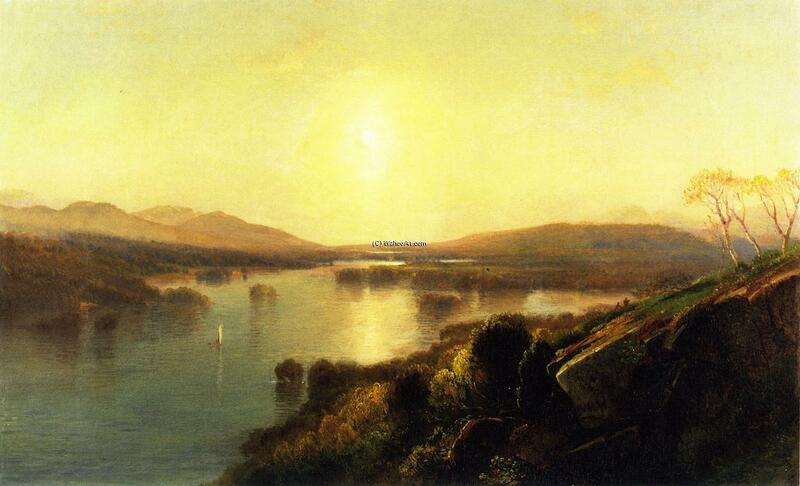 Eventually, several of the artists built homes on the Hudson River. 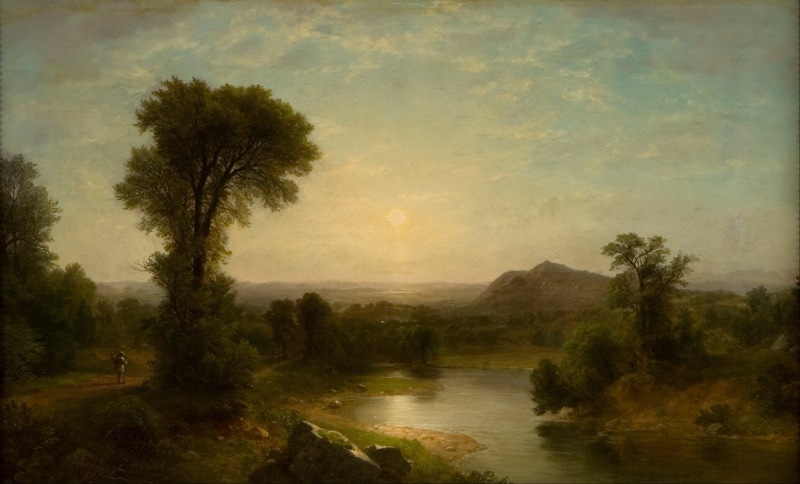 Though the earliest references to the term "Hudson River School" in the 1870s were disparagingly aimed, the label has never been supplanted and fairly characterizes the artistic body, its New York headquarters, its landscape subject matter, and often literally its subject. 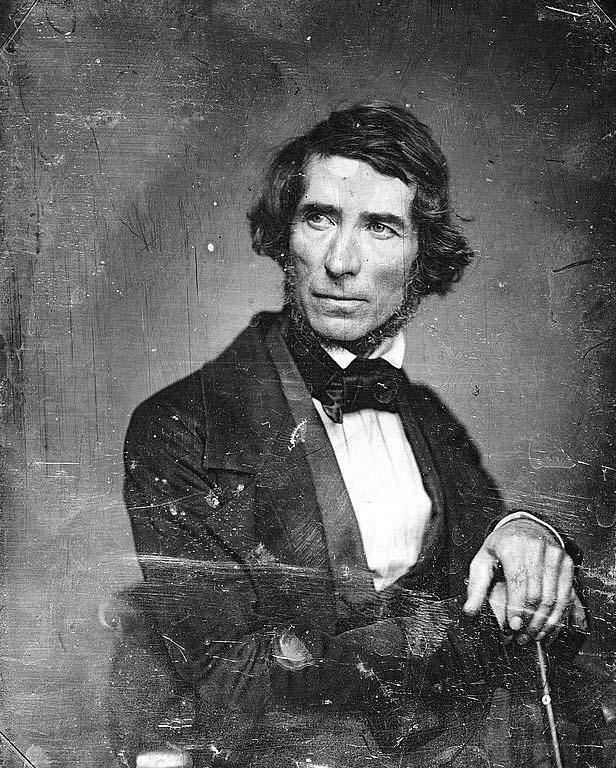 If Cole is rightly designated the founder of the school, then its beginnings appear with his arrival in New York City in 1825. 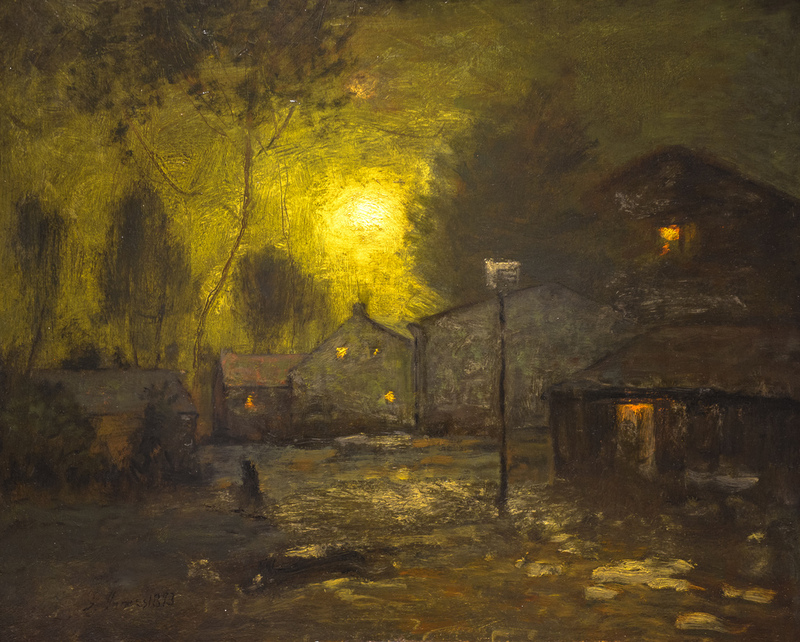 He determined to become a landscape painter after a period of itinerant portrait painting in Ohio and western Pennsylvania, and a stint in Philadelphia during which he admired and imitated the landscapes of early American specialists such as Thomas Doughty. 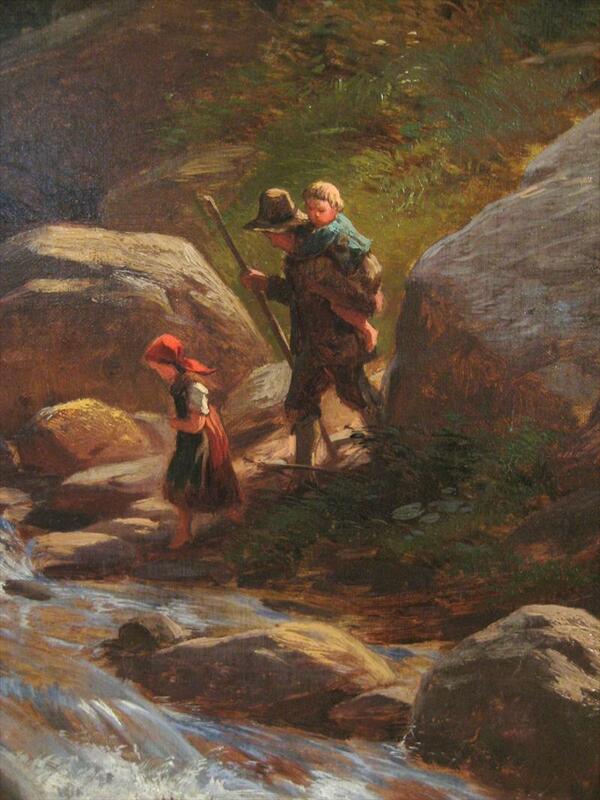 As significantly, in 1824, a tourist hotel was opened in the Catskill Mountains one hundred miles upriver from New York. 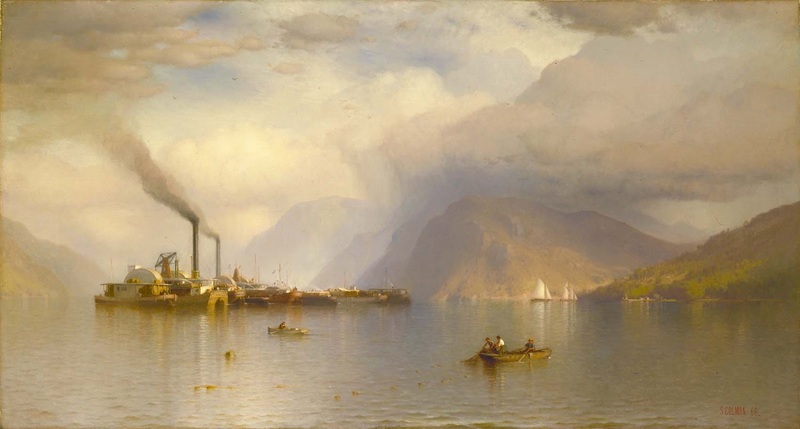 Once in New York in late 1825, Cole sailed for the Catskills, making sketches there and elsewhere along the banks of the Hudson. 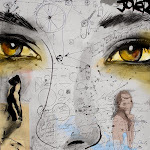 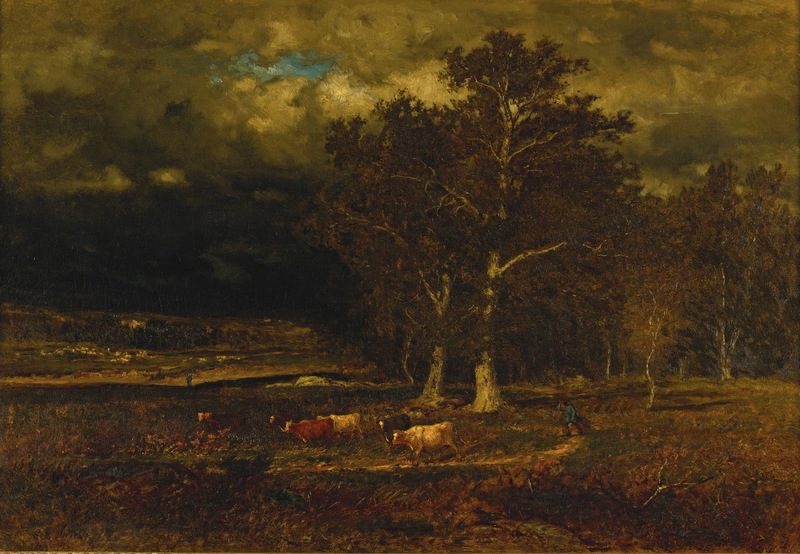 He produced a series of paintings that, when spotted in a bookstore window by three influential artists, gained him widespread commissions and almost instant fame. 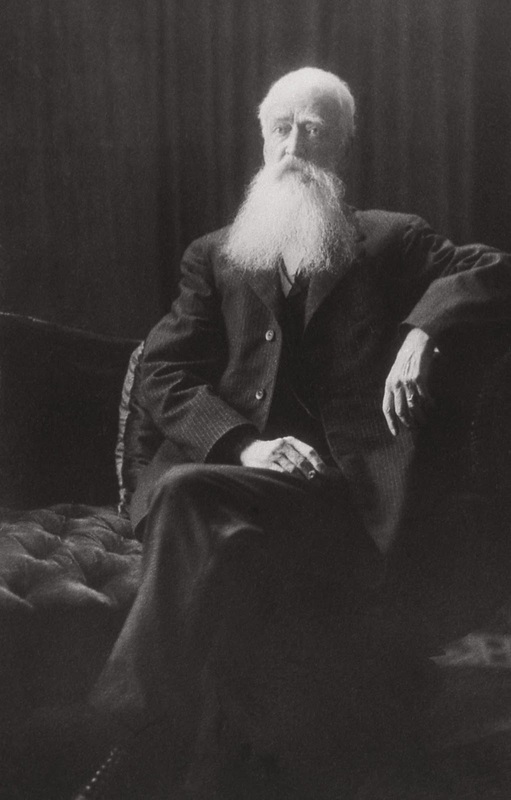 He was welcomed into the larger cultural life of the city, and was befriended especially by William Cullen Bryant, the poet and newspaper editor, who wrote a sonnet to Cole when he departed on a Grand Tour of Europe in 1829. 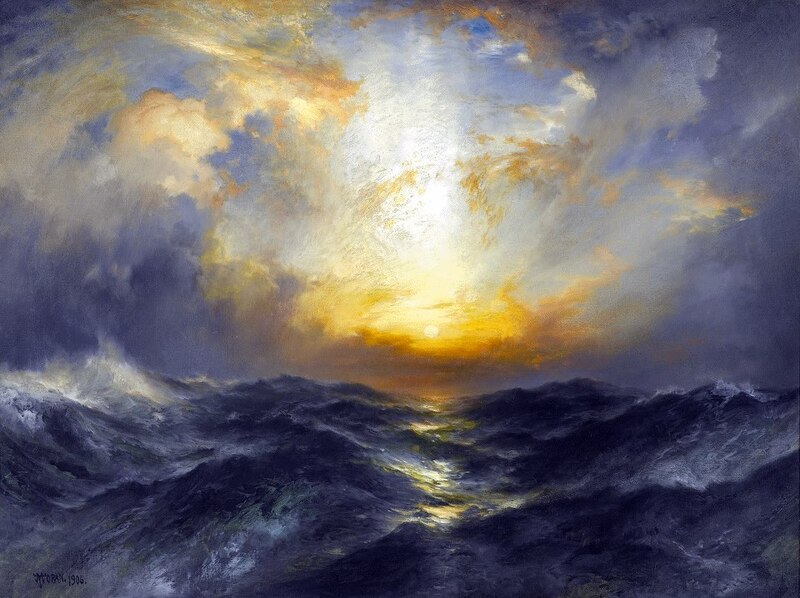 From the start, Cole's style was marked by dramatic forms and vigorous technique, reflecting the British aesthetic theory of the Sublime, or fearsome, in nature. 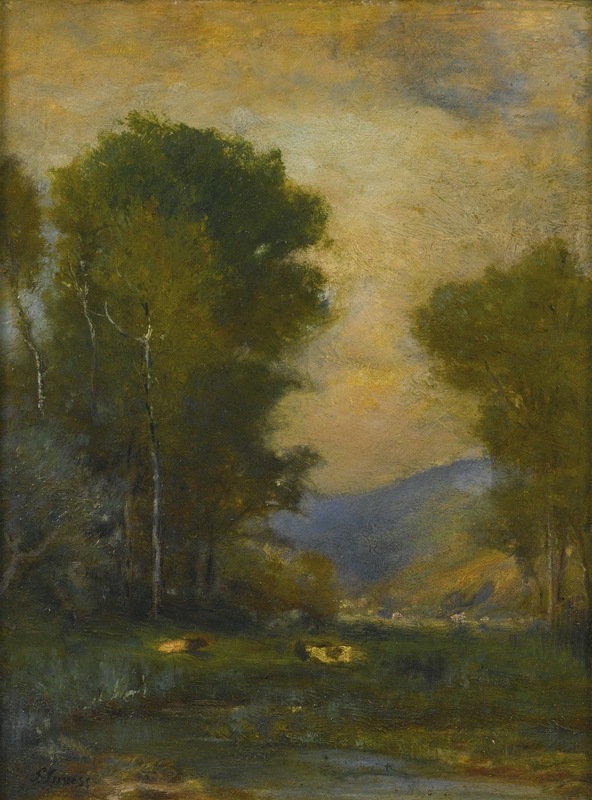 In the representation of American landscape, really in its infancy in the early nineteenth century, the application of the Sublime was virtually unprecedented, and moreover accorded with a growing appreciation of the wildness of native scenery that had not been seriously addressed by Cole's predecessors. 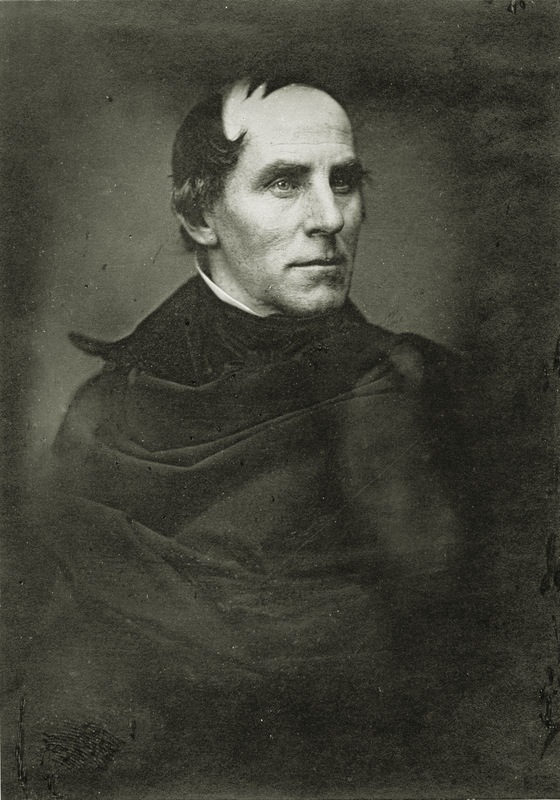 However, the wilderness theme had earlier gained currency in American literature, especially in the "Leatherstocking" novels of James Fenimore Cooper, which were set in the upstate New York locales that became Cole's earliest subjects, including several pictures illustrating scenes from the novels. 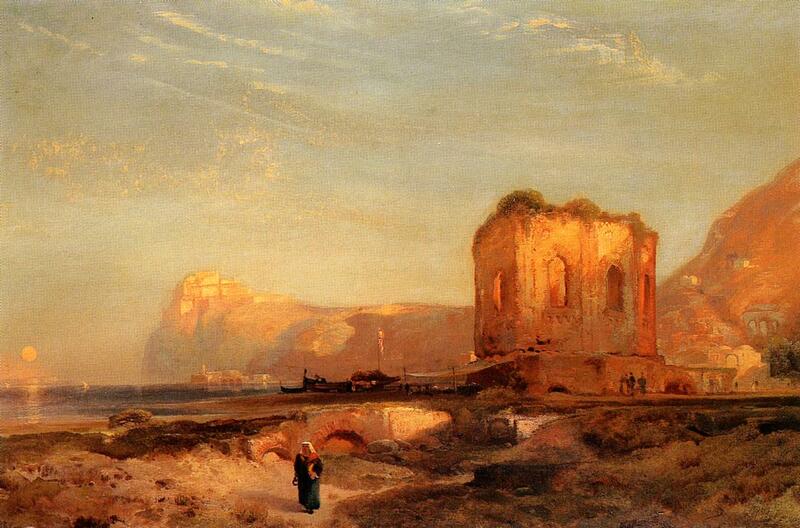 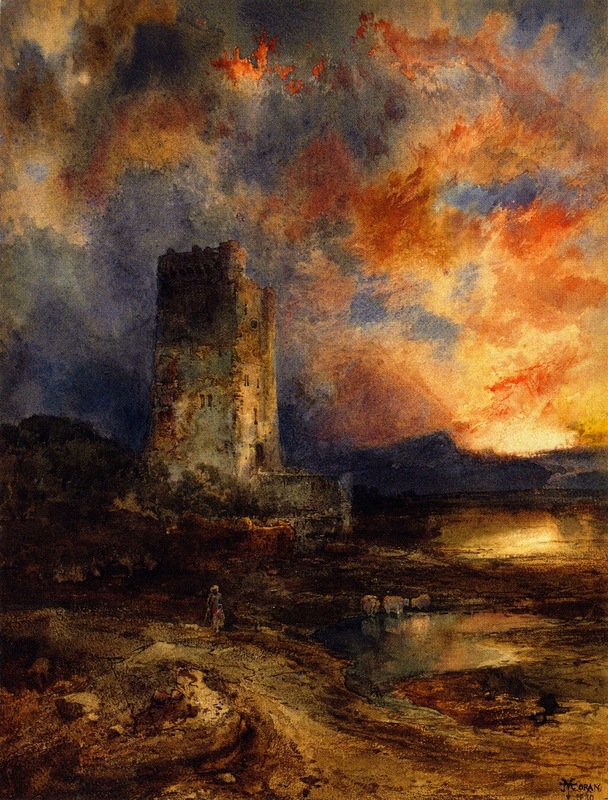 Fired by the initial reception to his work, as well as by engravings of historical landscapes by J. M. W. Turner and John Martin, Cole's ambitions swelled during his European tour. 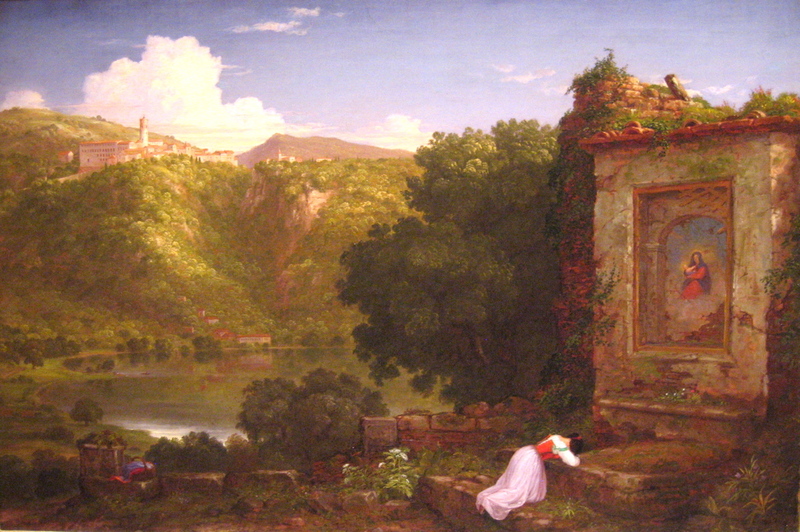 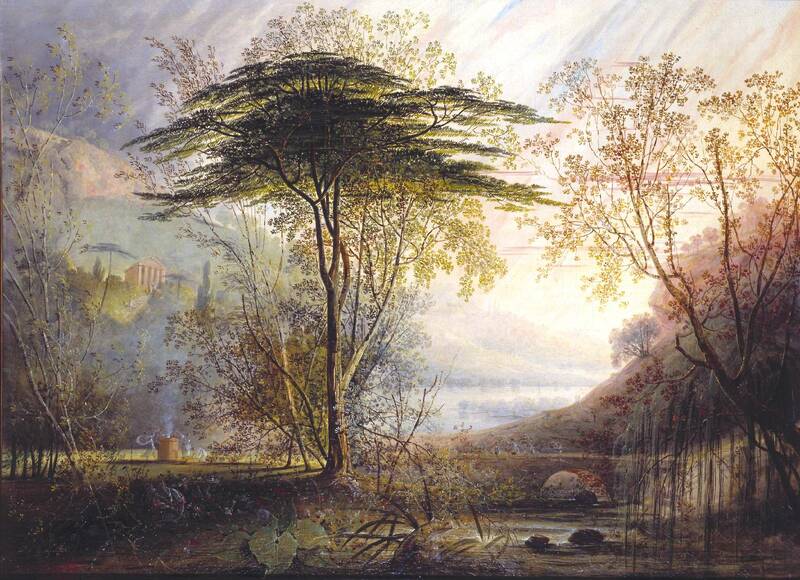 After Cole returned to America, he continued to interpret the Italian landscape in the form of monumental allegories comprising several pictures, such as The Course of Empire (1834-36; New-York Historical Society) and, following his second European trip in 1839-40, The Voyage of Life (1840; Munson-Williams-Proctor Arts Institute, Ithaca, N.Y.). 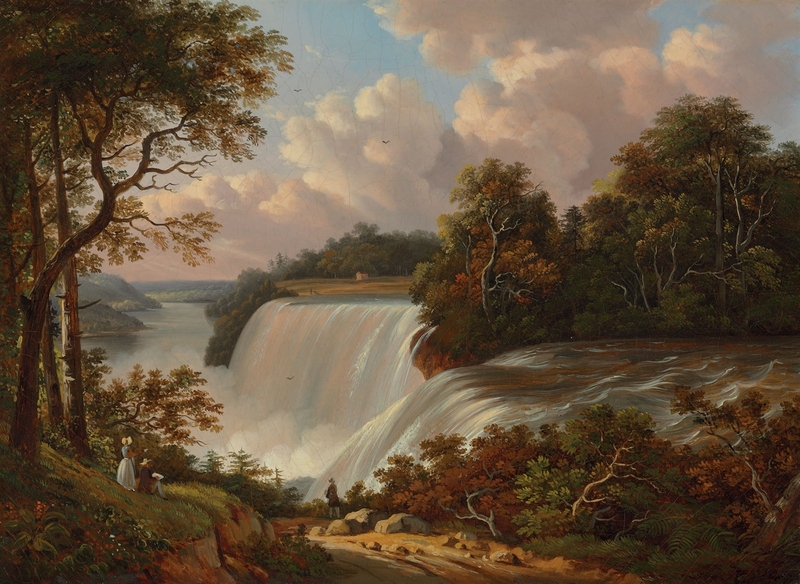 Cole continued to produce scenic American subjects, but even in those his aims were aggrandized by the historical and religious preoccupations of his mature career. 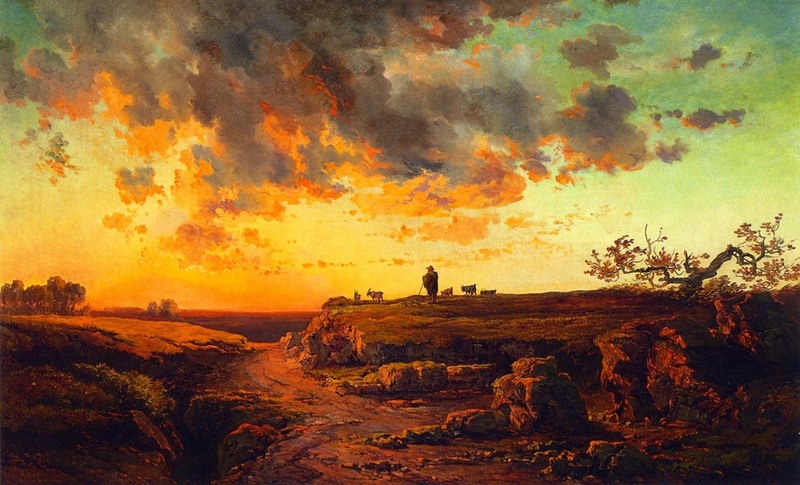 He died rather suddenly in Catskill, New York, where he had moved in 1836, starting a tradition followed by many Hudson River School artists. 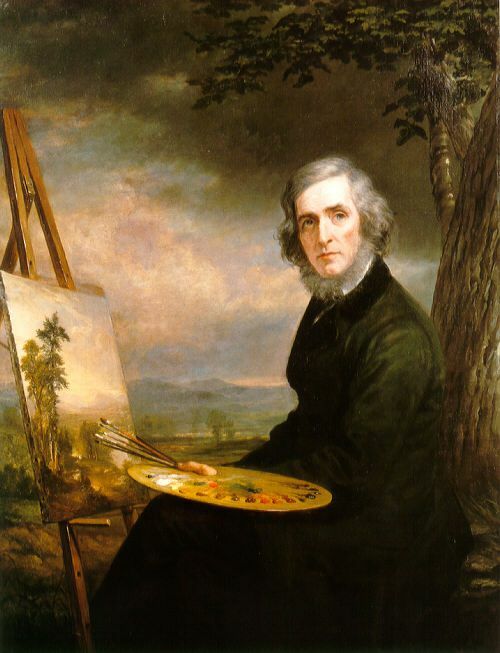 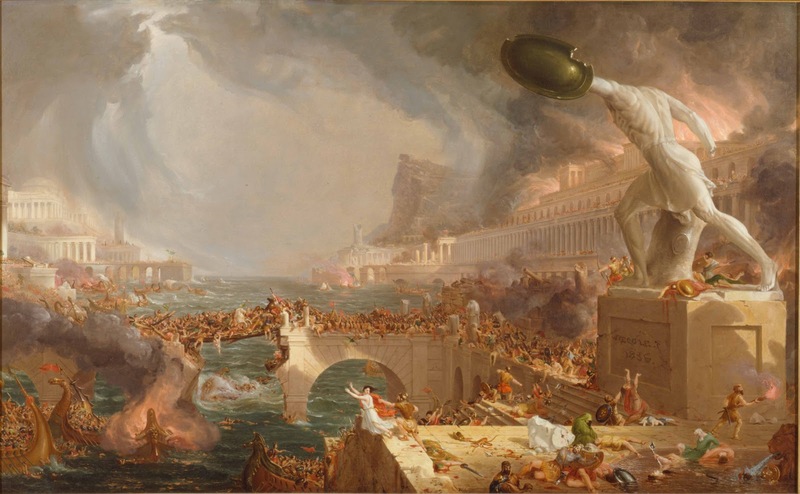 The engraver, portrait, and Genre painter Asher Durand was one of the three discoverers of Thomas Cole in 1825 and, in the following decade, was gradually moved to take up landscape painting himself. 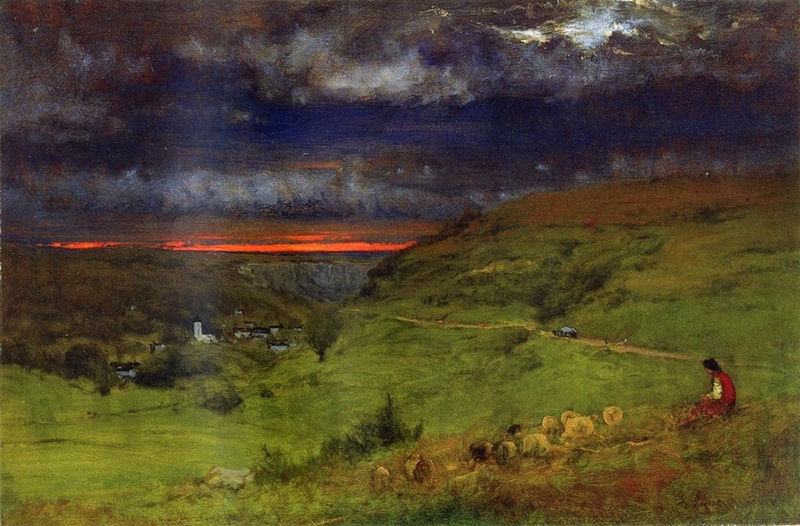 However, by the time Durand wrote "Letters on Landscape Painting" in the 1850s, he had seen the plein-air work of John Constable, Turner's colleague and rival, in England, and held Constable's naturalism up as the standard for young landscape painters—in the process, gently relegating Cole's histrionic subjects and style to the past. 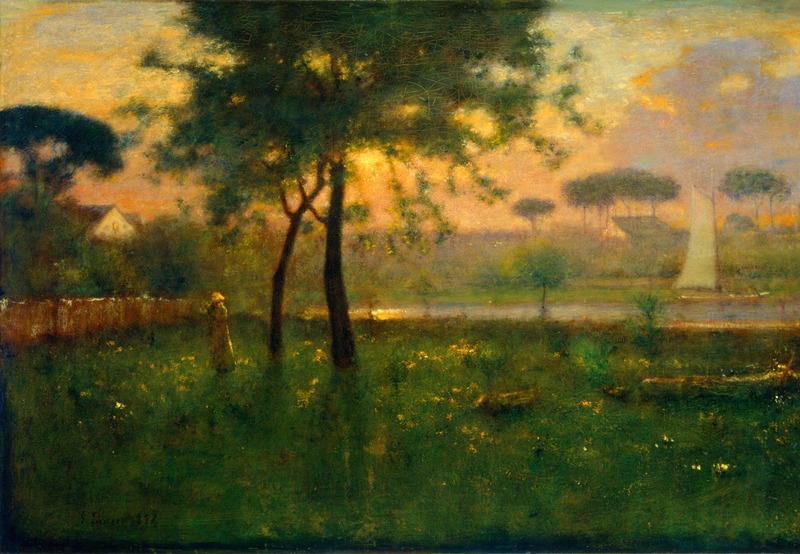 With the example of Durand in both word and practice, outdoor sketching in oils as the foundation of and model for studio landscapes became common, and both plein-airism and the loosening authority of Sublime aesthetics led to a less inflected idiom whose most conspicuous features often were the light influencing terrestrial forms and the air bathing them. 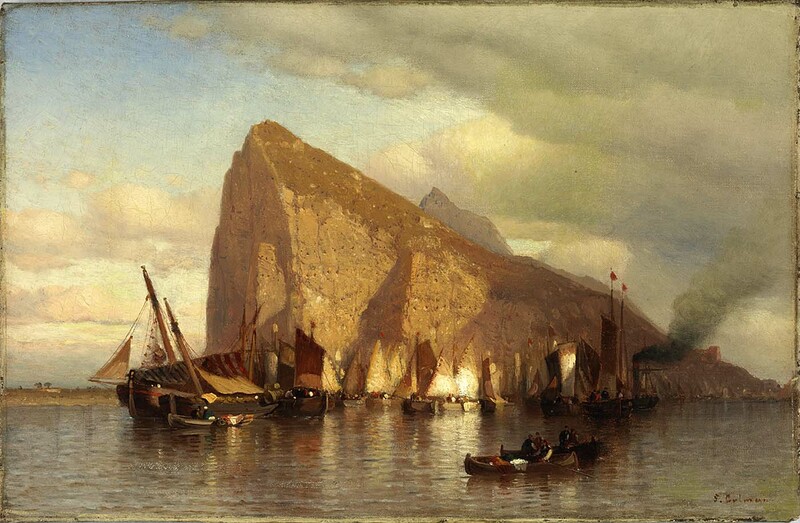 This trend coincided with the proliferation of tourist resorts both inland and on the coast during the Civil War period, along with the refinement of the vacation experience—increasingly pursued to relieve the pressures of urban workaday life. 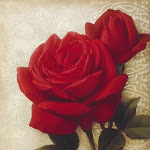 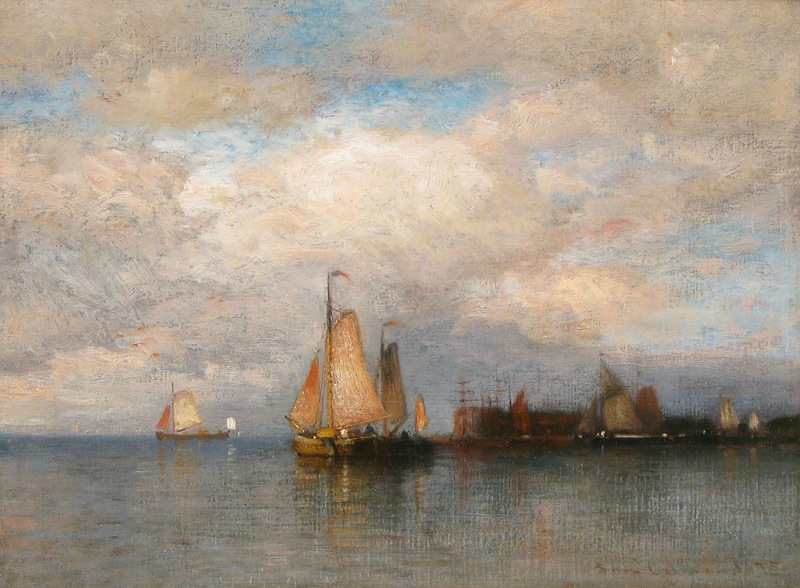 Painters who both reflected the new aesthetic standards and accommodated the vacationing class of patrons were John F. Kensett (1816-1872), Martin Johnson Heade (1819-1904), Worthington Whittredge (1820-1910), Sanford Robinson Gifford (1823-1880), Jasper Francis Cropsey (1823-1900) and Jervis McEntee (1828-1891). 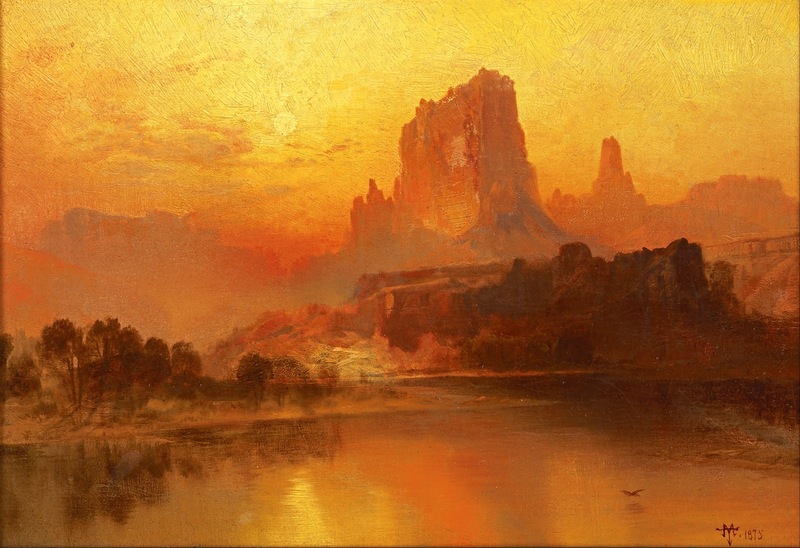 Somewhat exceptional were Frederic Church and Albert Bierstadt, who in a measure extended the heroic landscape ambitions of Cole after his death. 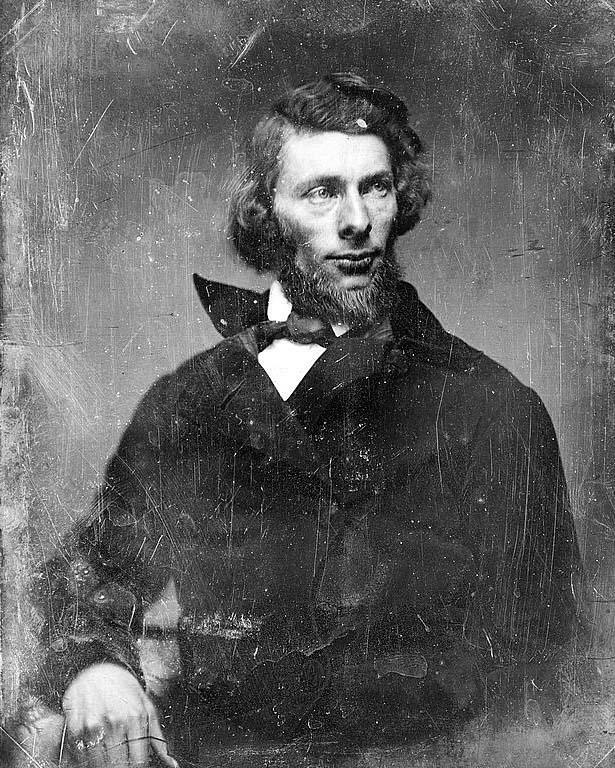 Church enjoyed the privilege and distinction of being Cole's student (1844-46), but supplanted his teacher's literary and historical conceits with scientific and expeditionary ones. 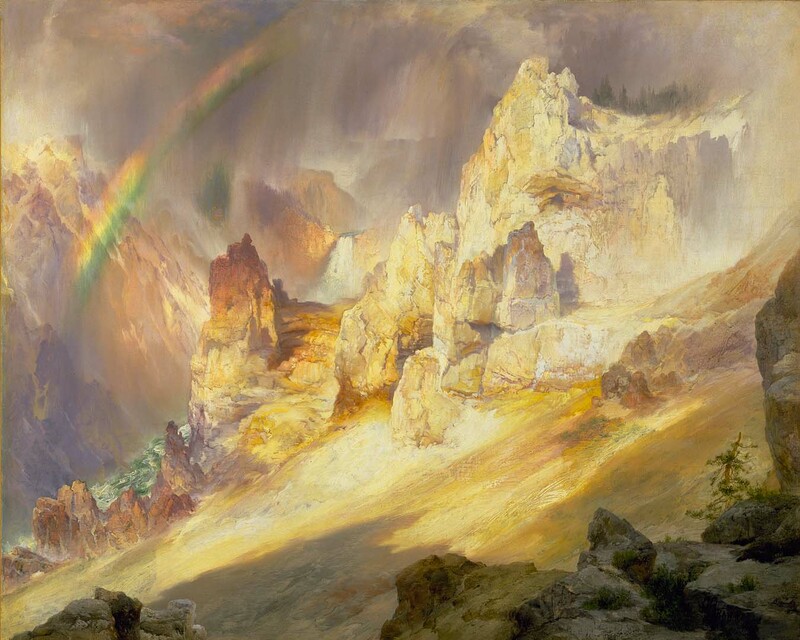 Establishing his reputation with outsize depictions of North American scenic wonders such as Niagara Falls, Church was stirred by the travel accounts and scientific tracts of the German naturalist Alexander von Humboldt to journey twice to South America in the 1850s and paint large-scale landscapes of the equatorial Andean regions that encompassed torrid to frigid habitats in a single picture—the Earth in microcosm. 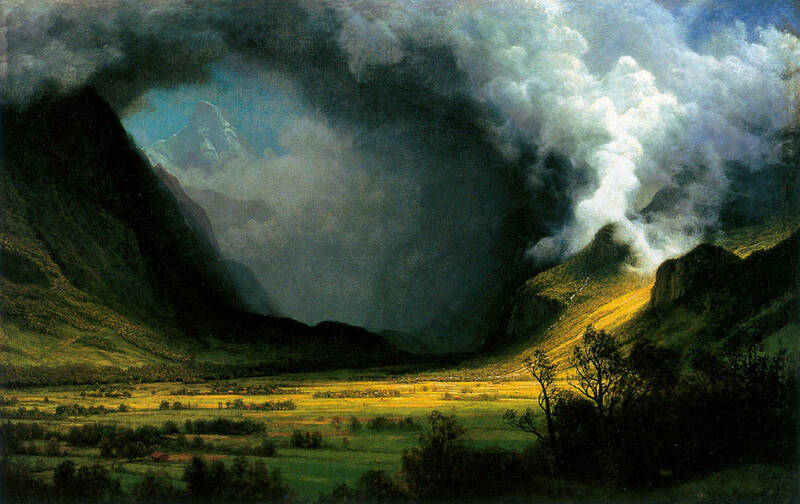 The Museum's ten-foot-wide Heart of the Andes (09.95) is the most ambitious and acclaimed of these works. 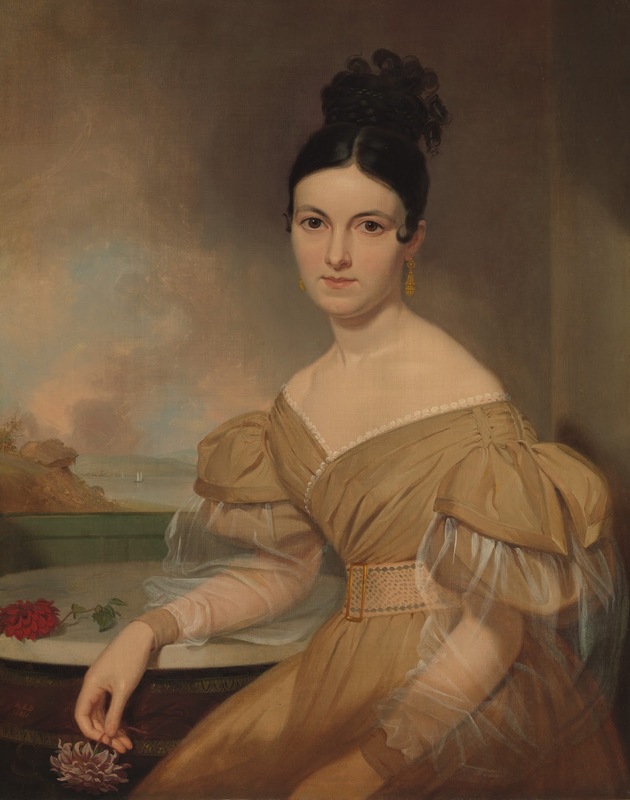 It was promoted as a single-picture attraction—i.e., set in a dark, windowlike frame draped with curtains and starkly illuminated in an otherwise darkened room—that drew thousands of paying spectators in New York, London, and eight other American cities. 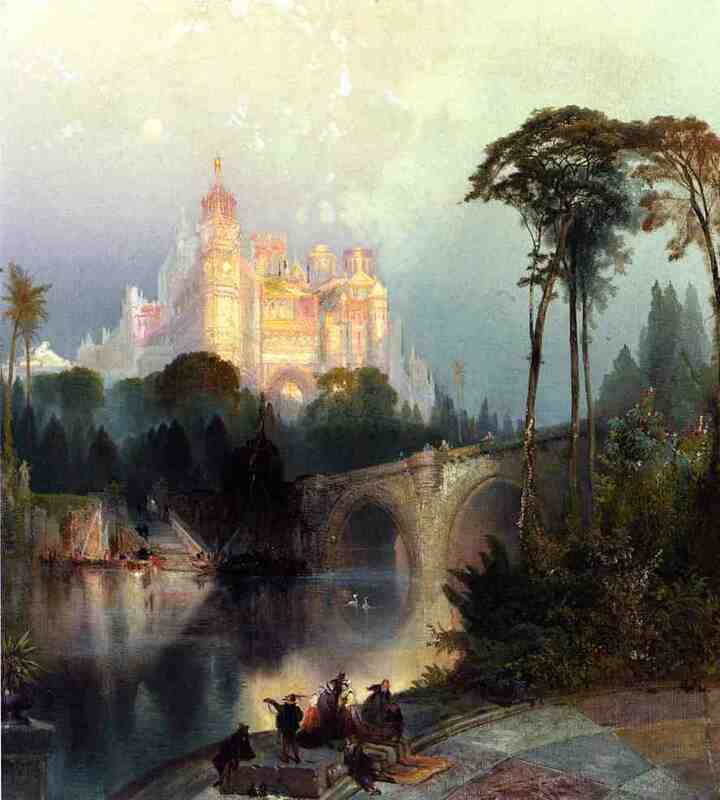 Later Church exhibited "full-scale" paintings of the Arctic regions and the Holy Land. 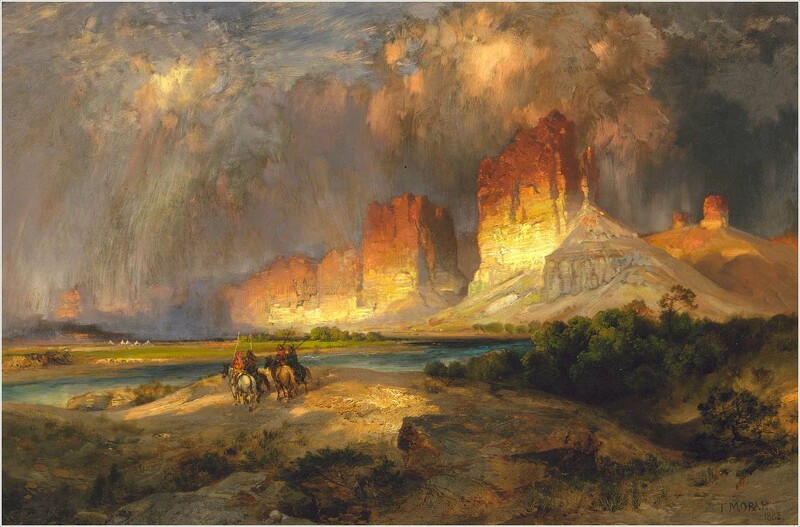 In the Civil War years, Church's only serious rival was Albert Bierstadt, an émigré who returned to his native Germany to study art at the Düsseldorf Academy. 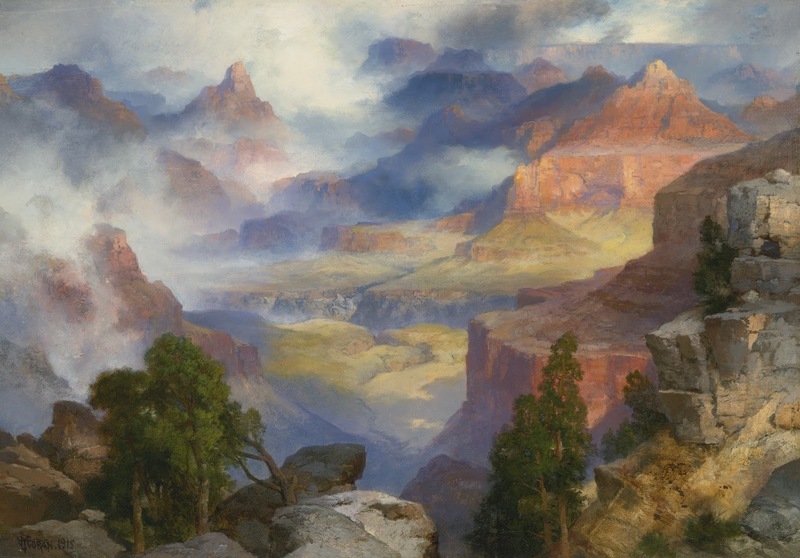 After a stint in Switzerland and Italy, he returned to the U.S. to seize—just as Church had the southern hemisphere—the American West as his artistic frontier. 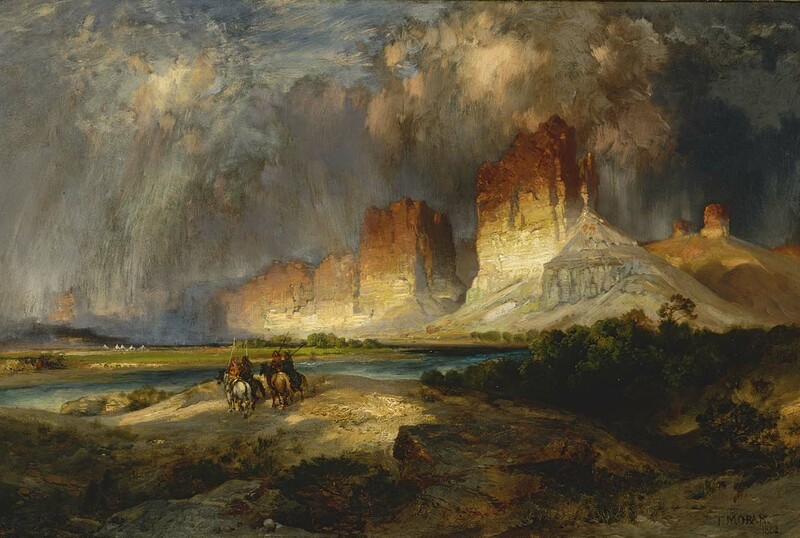 The Museum's six-by-ten-foot Rocky Mountains, Lander's Peak (07.123) was the chief product of Bierstadt's first journey to the Rockies of Wyoming with the government survey expedition of Colonel Frederick W. Lander. 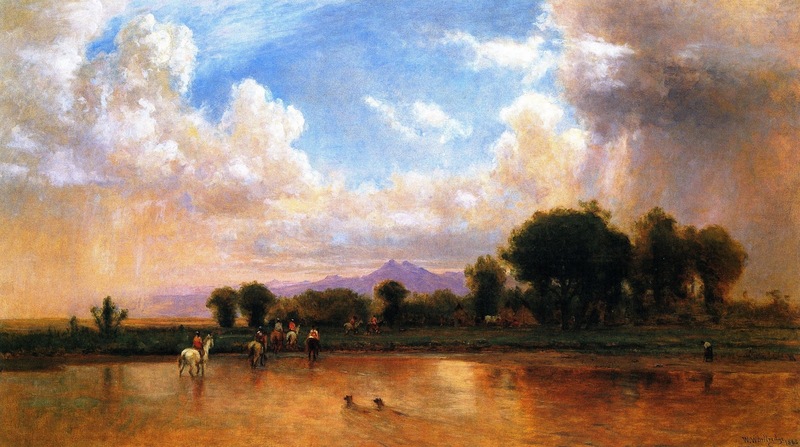 The great painting was placed as a deliberate complement and competitor opposite The Heart of the Andes in the art gallery of the Metropolitan Fair in New York in 1864. 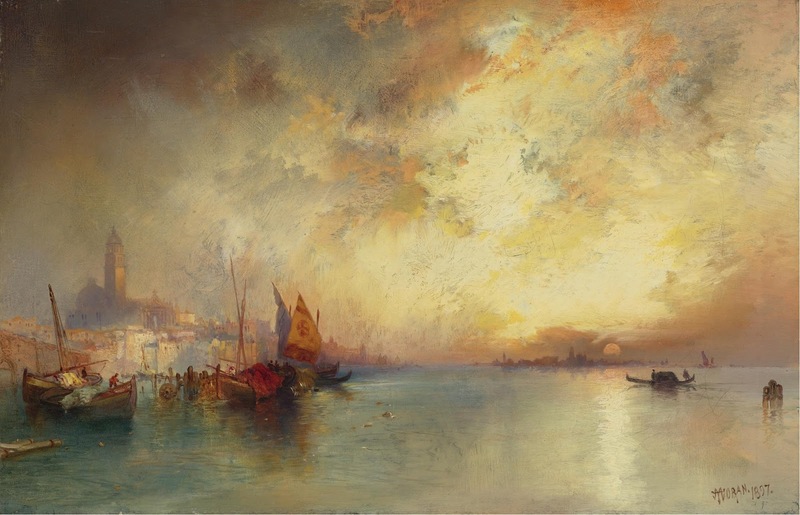 In another gallery of the fair, the artist mounted a tableau vivant of real Indians recalling those in the foreground of his picture. 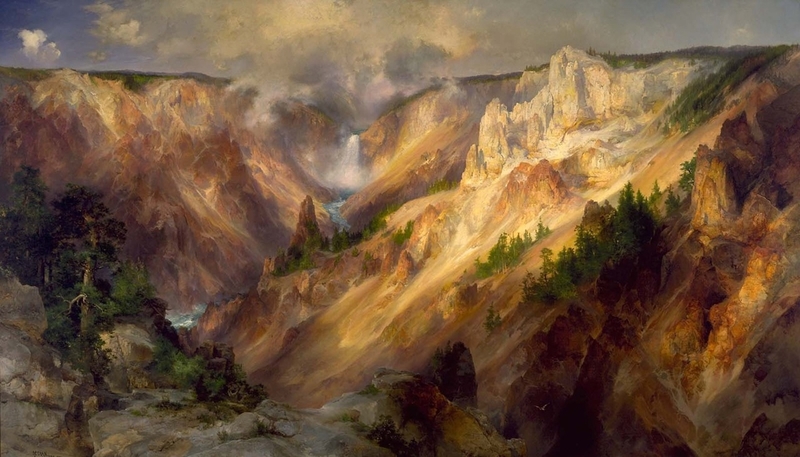 In 1866, Bierstadt was among the earliest white visitors to Yosemite, and produced many large paintings of that region. 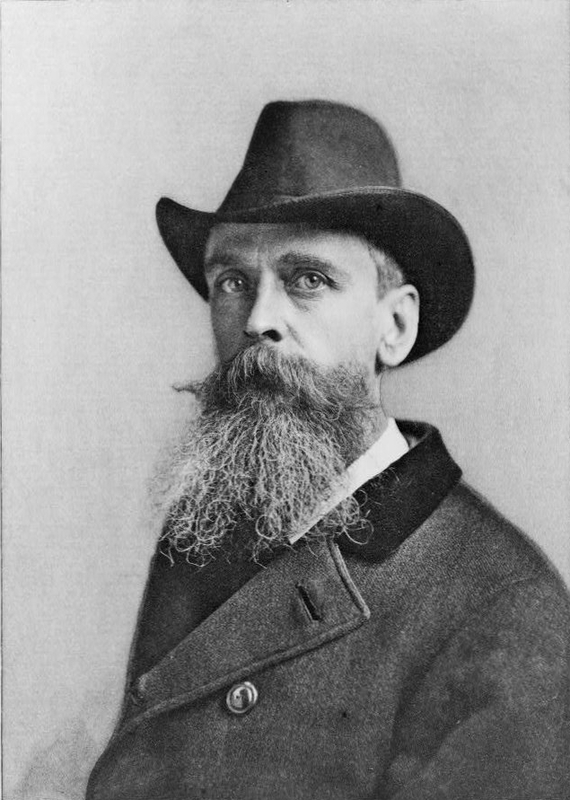 He toured many times in the West, as well as in Canada, Alaska, Europe, and the Bahamas, and cultivated a large international clientele. 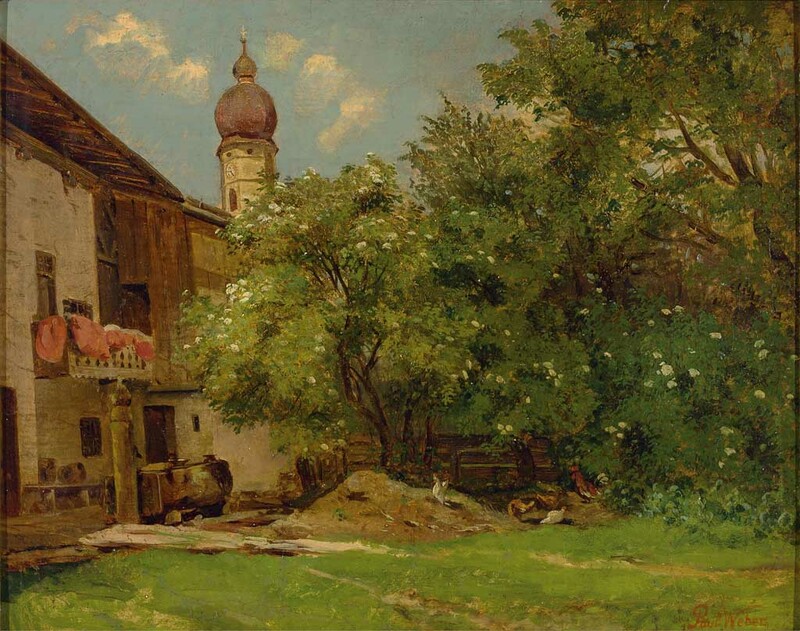 His numerous sales enabled him to build a baronial mansion on the Hudson River at Irvington in 1866, even as Church was beginning his great home overlooking the river at Hudson, New York. 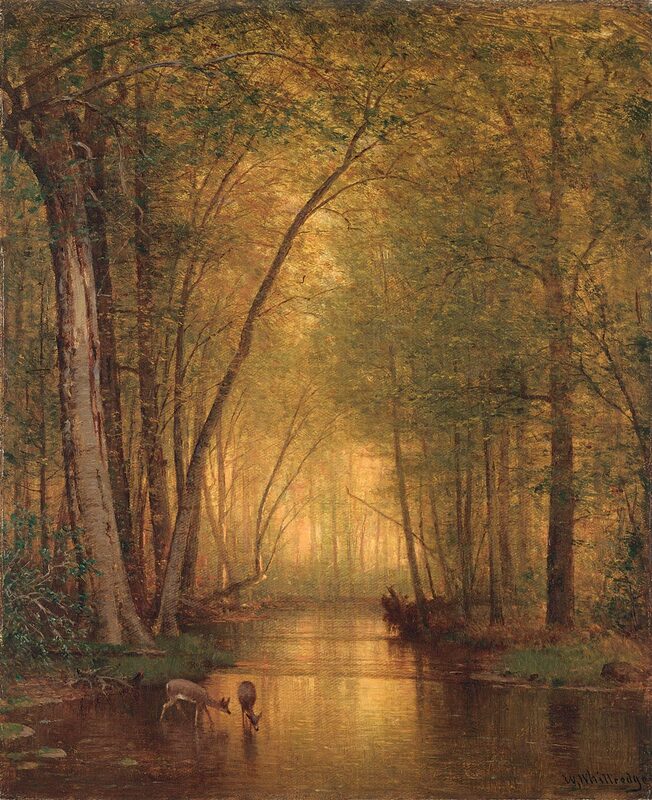 By the time Church and Bierstadt died, respectively in 1900 and 1902, the Hudson River School had been virtually forgotten. Its fall from grace began about the time of the Centennial. 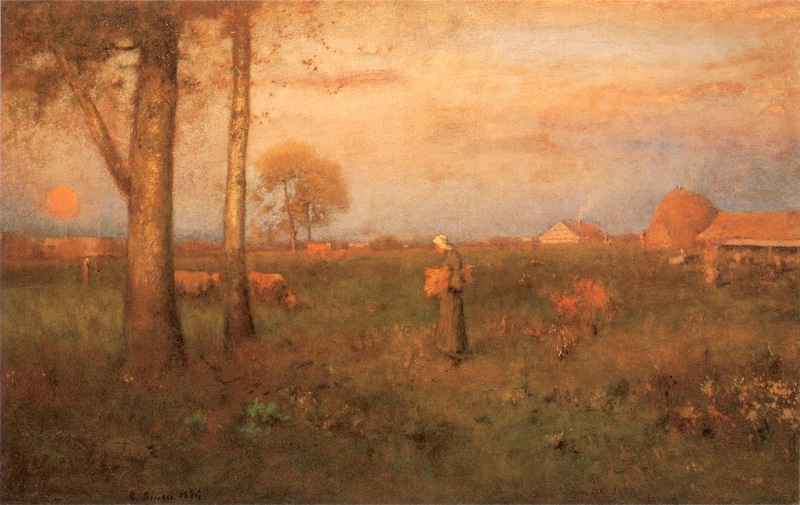 After the Civil War, the aesthetic orientation of the United States shifted from Great Britain, the mother culture, to the Continent, especially France. 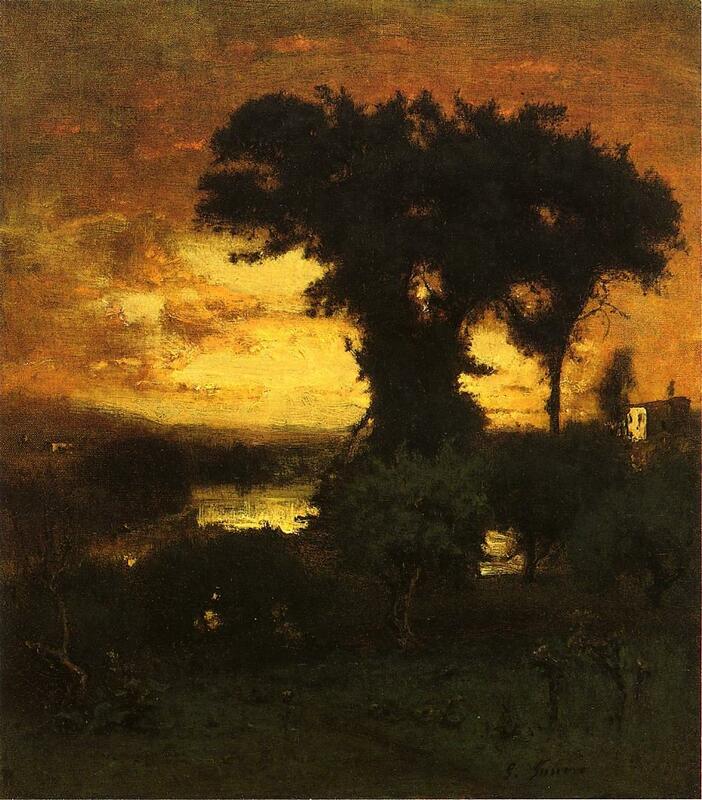 The appeal of figure painting grew somewhat at the expense of landscape, but the face of landscape painting itself altered with the influence of the softer, more intimate French Barbizon style first adapted to American scenery by George Inness (1825-1894). 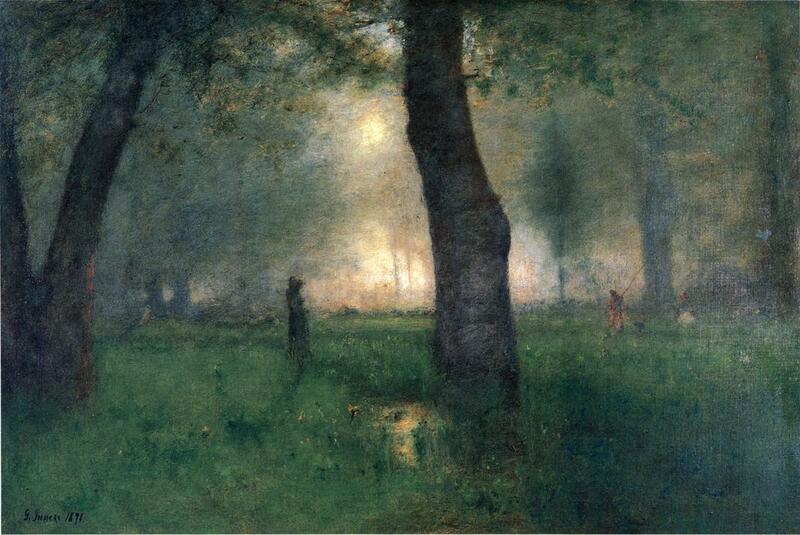 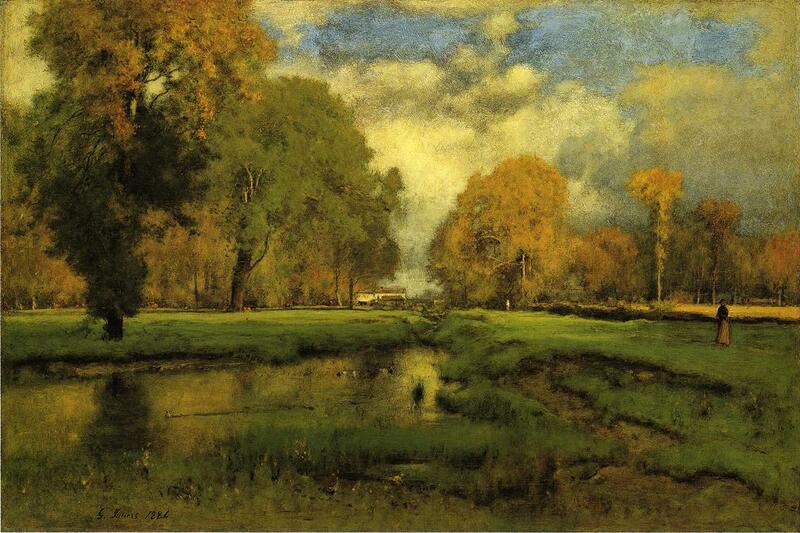 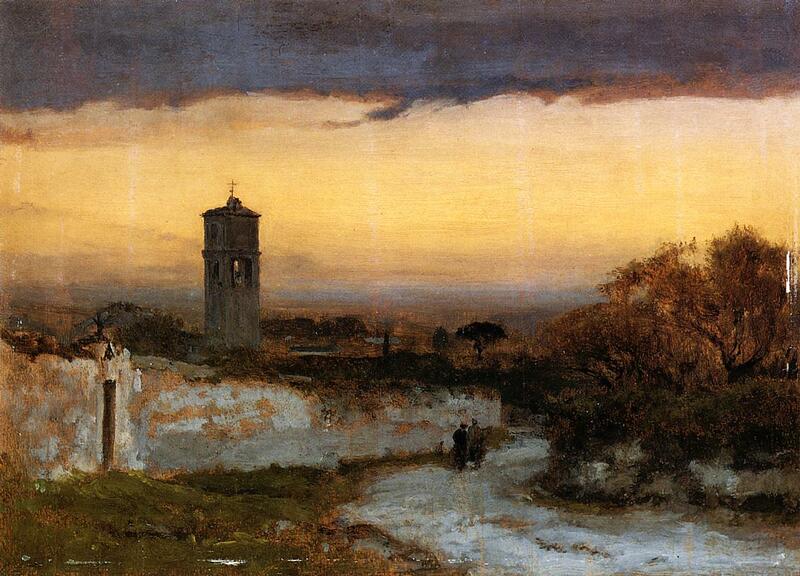 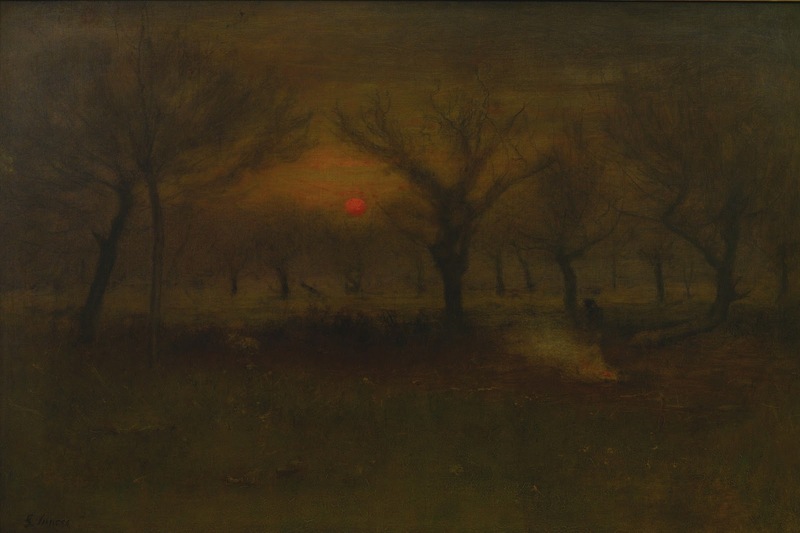 At first spurned or ignored by critics, Inness gained admiration through the Civil War and Reconstruction periods. 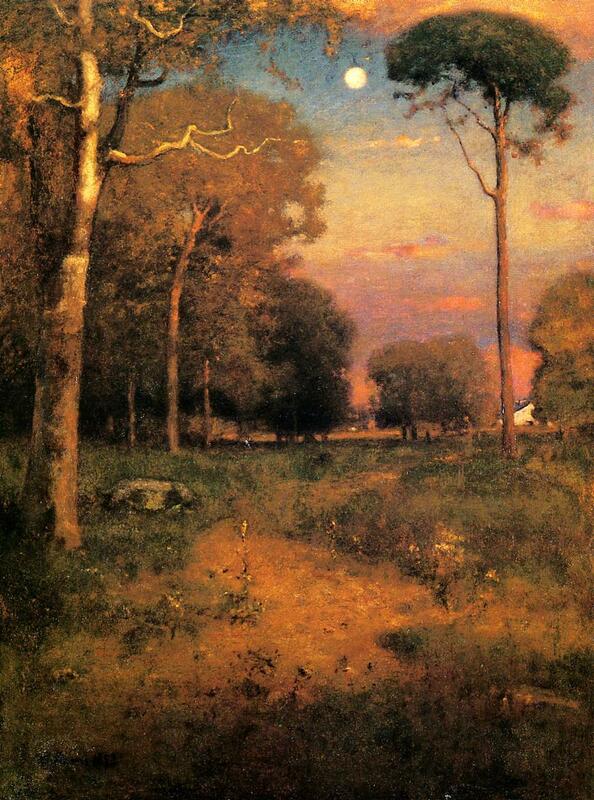 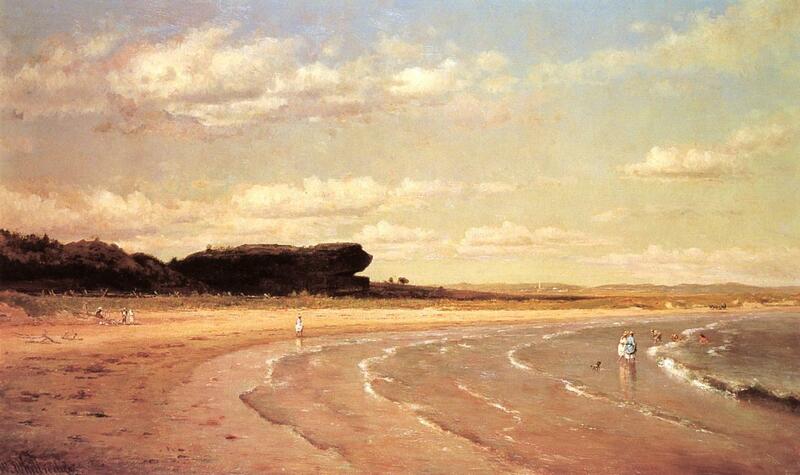 By the 1880s, he had become the most highly regarded landscape painter in America and was attracting many followers. 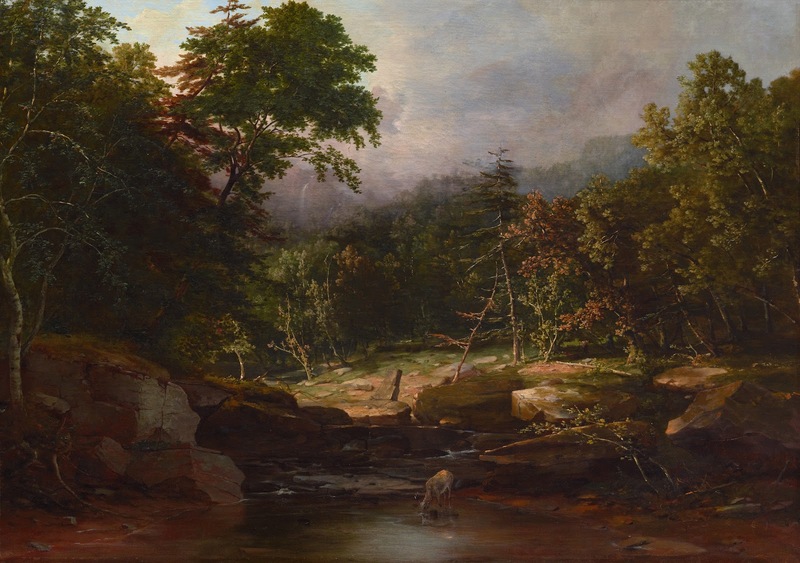 The Hudson River School, on the other hand, was increasingly assailed for its scenic and monumental aesthetics, prompting the derogatory label it has worn through its revival in the mid- and later twentieth century. 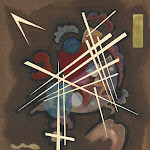 | Metropolitan Museum of Art, Kevin J. Avery - Department of American Paintings and Sculpture. 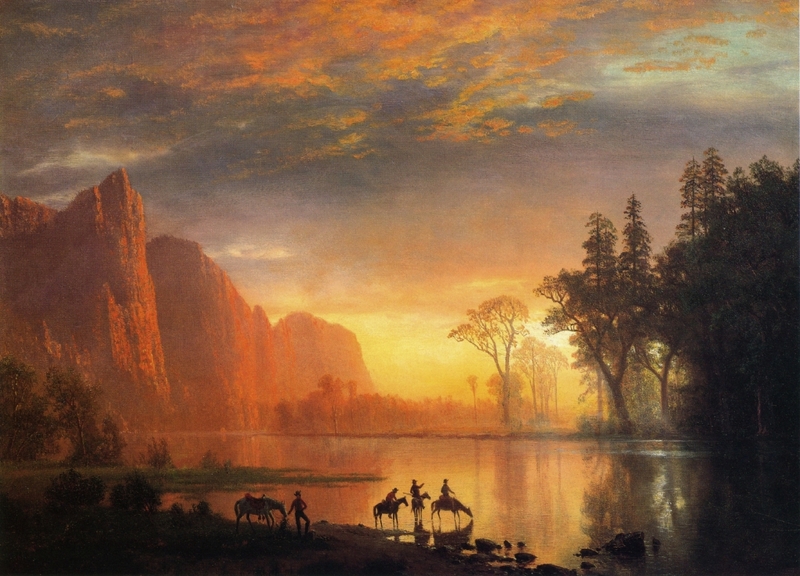 La Hudson River School fu un movimento artistico americano sviluppato nella metà del XIX secolo da un gruppo di paesaggisti influenzati dal romanticismo. 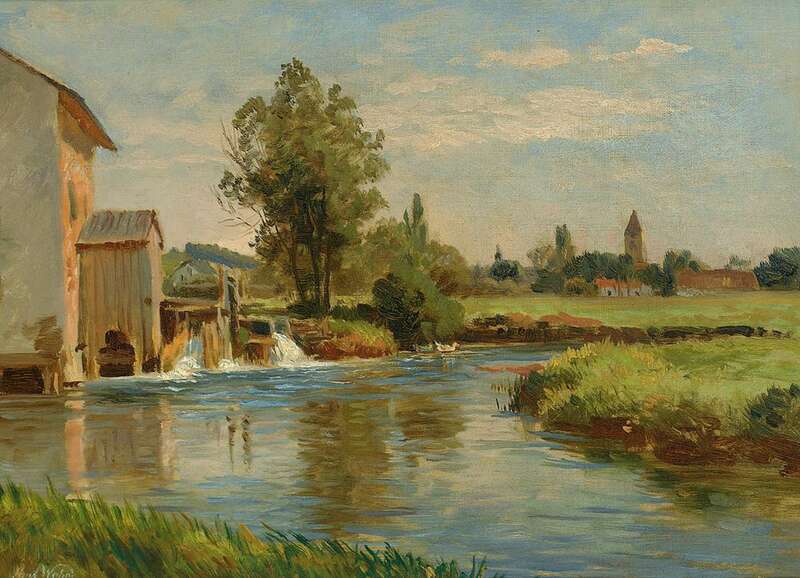 Il suo nome è dato dal fatto che la prima generazione di questi artisti usava dipingere nella valle del fiume Hudson e nella zona circostante. 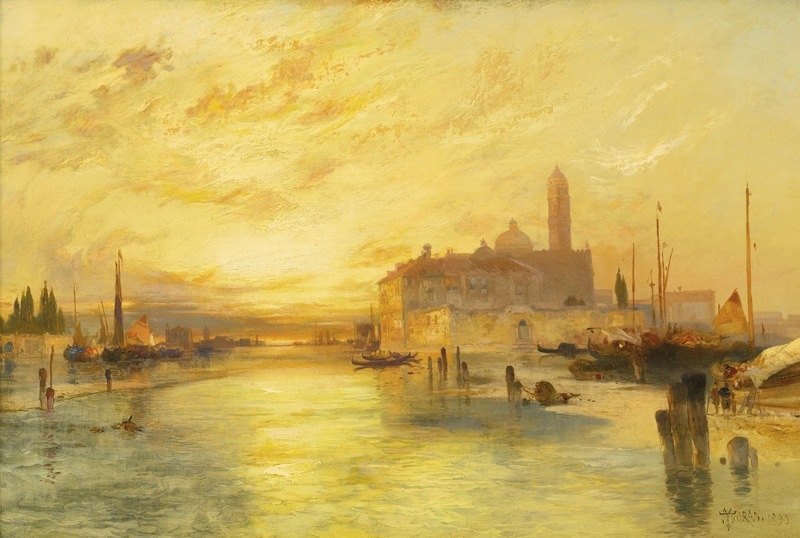 I pittori della seconda generazione di artisti associati alla scuola ampliarono la loro attività oltre i limiti della valle dell'Hudson per includere altre località. 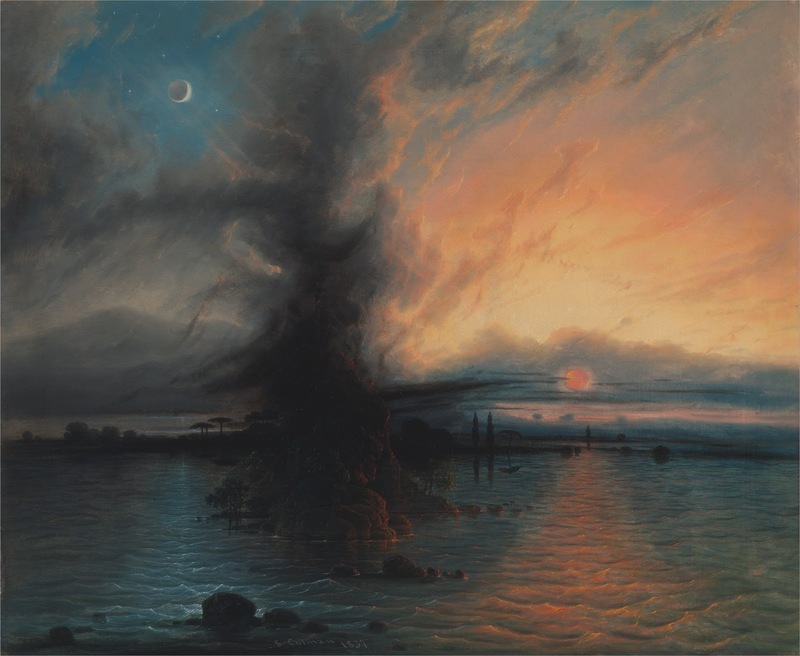 I dipinti della Hudson River School riflettono tre temi dell'America del XIX secolo: scoperta, esplorazione e insediamento. 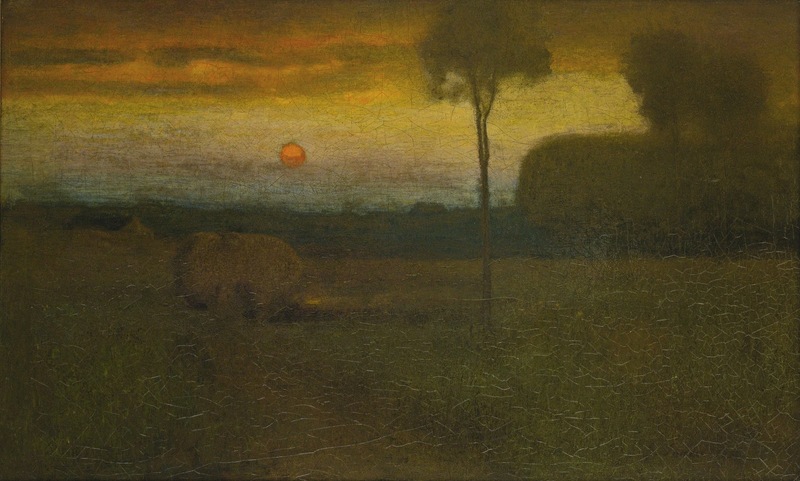 Inoltre questi dipinti rappresentano i paesaggi americani con un'impostazione pastorale, dove l'essere umano e la natura coesistono pacificamente. 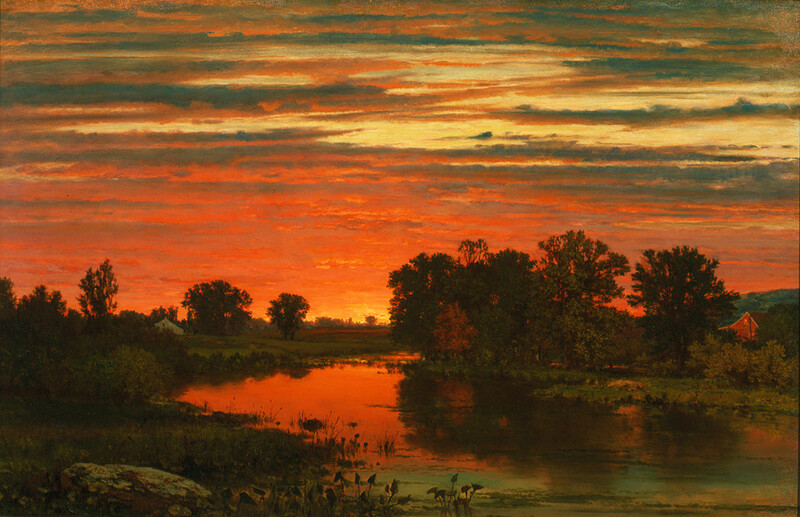 I paesaggi della Hudson River School sono caratterizzati da un realistico, dettagliato e talvolta idealizzato ritratto della natura, spesso contrapponendo alla pacifica agricoltura le zone disabitate restanti, allontanandosi velocemente dalla valle del fiume Hudson, così come veniva apprezzata per le sue qualità di imponenza e sublimità. 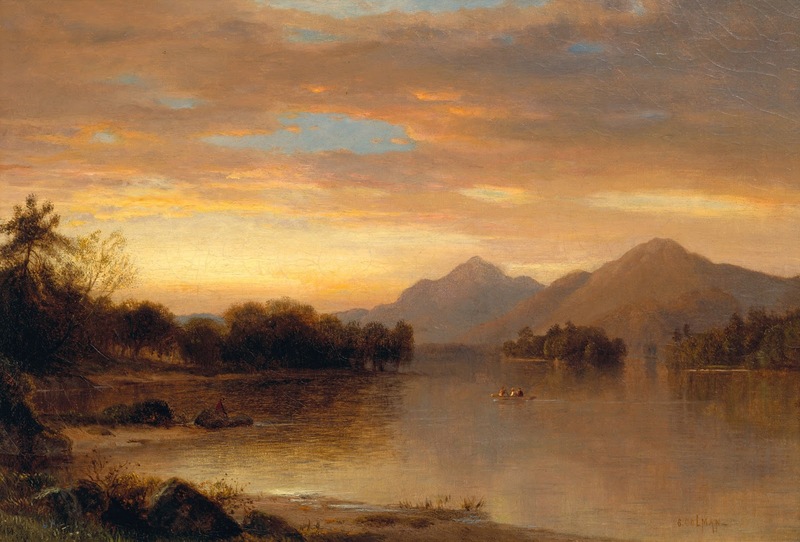 In generale gli artisti della Hudson River School pensavano che la natura, nella forma dei paesaggi americani, fosse un'ineffabile manifestazione di Dio, variata dagli artisti in base alla loro convinzione religiosa. 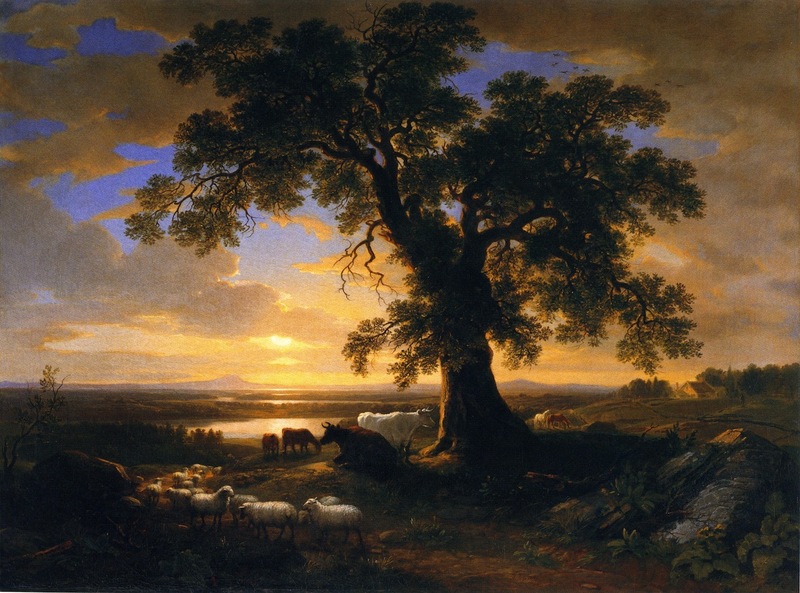 Essi si ispirarono a maestri europei come Claude Lorrain, John Constable e J. M. W. Turner, condividendo la loro ammirazione per le bellezze naturali dell'America con gli scrittori loro contemporanei Thoreau ed Emerson.